In this verse it is clearly indicated that Krishna consciousness is the only means of being delivered from the clutches of this contaminated material world. Sometimes unscrupulous commentators distort the meaning of what is clearly stated here: that all devotional service should be offered to the Supreme Personality of Godhead, Krishna. Unfortunately, unscrupulous commentators divert the mind of the reader to that which is not at all feasible. Such commentators do not know that there is no difference between Krishna’s mind and Krishna. Krishna is not an ordinary human being; He is Absolute Truth. His body, His mind and He Himself are one and absolute. It is stated in the Kurma Purana. as it is quoted by Bhaktisiddhanta Sarasvati Gosvami in his Anubhasya comments on Caitanya-caritamrita (Fifth Chapter, Adi-lila, verses 41–48), deha-dehi-vibhedo ’yam nesvare vidyate kvacit. This means that there is no difference in Krishna, the Supreme Lord, between Himself and His body. But because the commentators do not know this science of Krishna, they hide Krishna and divide His personality from His mind or from His body. Although this is sheer ignorance of the science of Krishna, some men make profit out of misleading people. There are some who are demonic; they also think of Krishna, but enviously, just like King Kamsa, Krishna’s uncle. He was also thinking of Krishna always, but he thought of Krishna as his enemy. 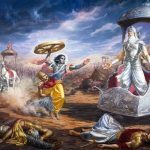 He was always in anxiety, wondering when Krishna would come to kill him. That kind of thinking will not help us. One should be thinking of Krishna in devotional love. That is bhakti. One should cultivate the knowledge of Krishna continuously. What is that favorable cultivation? It is to learn from a bona fide teacher. Krishna is the Supreme Personality of Godhead, and we have several times explained that His body is not material, but is eternal, blissful knowledge. This kind of talk about Krishna will help one become a devotee. Understanding Krishna otherwise, from the wrong source, will prove fruitless. One should therefore engage his mind in the eternal form, the primal form of Krishna; with conviction in his heart that Krishna is the Supreme, he should engage himself in worship. There are hundreds of thousands of temples in India for the worship of Krishna, and devotional service is practiced there. When such practice is made, one has to offer obeisances to Krishna. One should lower his head before the Deity and engage his mind, his body, his activities—everything. That will make one fully absorbed in Krishna without deviation. This will help one transfer to the Krishnaloka. One should not be deviated by unscrupulous commentators. One must engage in the nine different processes of devotional service, beginning with hearing and chanting about Krishna. Pure devotional service is the highest achievement of human society. 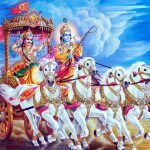 The Seventh and Eighth chapters of Bhagavad-gita have explained pure devotional service to the Lord that is free from speculative knowledge, mystic yoga and fruitive activities. Those who are not purely sanctified may be attracted by different features of the Lord like the impersonal brahmajyoti and localized Paramatma, but a pure devotee directly takes to the service of the Supreme Lord. 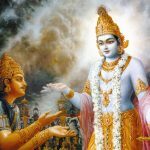 There is a beautiful poem about Krishna in which it is clearly stated that any person who is engaged in the worship of demigods is most unintelligent and cannot achieve at any time the supreme award of Krishna. The devotee, in the beginning, may sometimes fall from the standard, but still he should be considered superior to all other philosophers and yogis. One who always engages in Krishna consciousness should be understood to be a perfectly saintly person. His accidental nondevotional activities will diminish, and he will soon be situated without any doubt in complete perfection. The pure devotee has no actual chance to fall down, because the Supreme Godhead personally takes care of His pure devotees. Therefore, the intelligent person should take directly to the process of Krishna consciousness and happily live in this material world. He will eventually receive the supreme award of Krishna. In this verse the Lord concludes by describing the method of worship. Therefore, having absorbed your body and mind in me (atmanam yukta), you will certainly come to me. That supreme position of pure bhakti, the topmost secret, which has the ability to judge who is qualified and unqualified, and by its contact purifies all persons, has been described in this chapter. 9.34 Focus your mind on Me; fix your mind on Me uninterruptedly like a continous stream of oil — on Me the Ruler of rulers, antagonistic to all that is evil, the sole abode of auspiciousness, omniscient, whose resolve is always true, the sole cause of the entire universe, the Supreme Brahman, the Supreme Person; on Me, of long large eyes like a lotus petal; who has the complexion of a clear blue cloud; whose shining lustre is like that of a thousand suns simultaneously risen; on Me, the great ocean of the nectar of beauty; of four arms, noble and strong, and of brilliant yellow raiment; on Me, adorned with a pure crown, fish-shaped ear-rings, garlands, bracelet on the arms and bangles at the wrist; on Me, the ocean of infinite mercy, affability, beauty, sweetness, majesty, magnanimity and parental affection; on Me, the refuge of all without exception and without regard to their differences; on Me the Lord of all. Sri Krsna again makes the same clear. Be My devotee. Be one whose mind is focussed on Me by contemplating on Me as exceedingly dear. Such is the meaning. He makes thie yet clearer. Be My worshipper, namely, become engaged in My worship, which you have begun to practise by your experience of Me as supremely dear and unlimited and unsurpassed. What is called worship is the conduct of one who realises that he is absolutely a subsidiary — (Sesa) of God. Worship consists also in offering all things of enjoyment such as waving of lights etc., all those things which come into bodily contact like garlands, sandal paste etc., and those meant for offering like food preparations and other edibles. The meaning is this: Let your mind be focussed on Me so as to be engaged in My worship, resulting from love which is unlimited and unsurpassed and which is born from the experience of Myself. Again Sri Krsna expounds the same: Bow down to Me. Do not be satisfied only with services of one who is absolutely subsidiary to me. Do services which are incomparably dear and animated by an experience of Myself who is dear and unlimited and unsurpassed. Also bow down to Me in utter humility, regarding Me as the supreme goal, i.e., He who is the supreme abode and the supreme goal. The meaning is that having resorted to Me, it is impossible for you to live without Me. Having disciplined the mind in this way and considering Me as the supreme goal, you will thus, through love which is unsurpassed and incomparable, obtain a mind which is fit for experiencing Me. You will then reach Me alone. Here the term Atman stands for the mind. The import is that, holding Me as the sole support, possesing a mind of this kind, meditating on Me, experiencing Me, worshipping Me and bowing down to Me — you will reach Me alone. Thus, with such a turn of mind you carry on, for pleasing Me alone, your secular works for bodily sustenance and Vedic activities like obligatory and occasional rites, regarding them as actuated by Me and finding sole joy in absolute subservience to Me. You shall ever engage yourself in praising My names with love and in endeavouring to serve Me and bowing down to Me etc. You shall contemplate on the entire universe as being under My rule and being subsidiary (Sesa) to Me. Contemplating on the multitudes of My attributes, which are exceedingly dear to you, and practising every day this worship as described, you will reach Me alone. This chapter concludes by revealing the pure, simplistic way of worshipping the Supreme Lord Krishna by the words man-manah focus one’s consciousness on Lord Krishna, mad bhakto be Lord Krishna’s devotee, mad yaji give propitiation and worship to Lord Krishna, mam namaskuru offer humble obeisances to Lord Krishna exclusively. By these direct and easy to perform activities, having Lord Krishna as the Supreme goal one will attain eternal life in the spiritual worlds in association with Him. Thus in this chapter entitled Confidential Knowledge of the Ultimate Truth, Lord Krishna has compassionately revealed some of His transcendental glories and the phenomenal greatness of bhakti or exclusive loving devotion. 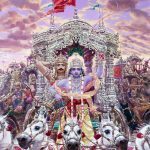 The Padma Purana states: Who is devoted to the Supreme Lord can never by inimical to the Supreme Lord and who is inimical to the Supreme Lord can never be a devotee of the Supreme Lord. Yet the Supreme Lord is always equitable in bestowing the rewards according to one’s devotion. The devotees are dear to the Supreme Lord. The karma or reactions to actions leading to merits and demerits are according to each one’s attributes. The stage of Brahmin and others are also normal for them according to their attributes and so is their moksa or liberation. A male human being is next born as a female because of desires or some demerit. A female human being is never born as a male because of attributes but they reside within the male body alongside the male form in a spiritual female form. These spiritual female forms are unlimitedly superior to those who have taken female forms due to the demerit of desires. Concluding this chapter Lord Krishna reveals a concise and direct form of worship that is possible for anyone. He begins with man manas meaning to focus one’s consciousness upon Lord Krishna, the Supreme Being, the Ultimate Reality, the Supreme Controller, the Omniscient, the Omnipotent, the all pervading One. Overflowing with all auspicious attributes, devoid of any defect, of indomitable will, the sole refuge for all, the veritable source, origin and cause of all creation, who is always of fulfilled desires, who bestows benedictions upon His devotees, and removes all their defects. Whose transcendental form is the embodiment of eternity, endless knowledge and unlimited bliss as well as many other captivating qualities such as beauty, compassion, charm and sweetness. Who is able to attract the minds of the deep meditaters as well as capture the minds of even the muktas or liberated beings and becomes their sole object of meditation thereafter. One should endow their consciousness to flow incessantly to Lord Krishna an ocean of mercy like the continuous flow of the river Ganga flows incessantly to the ocean. This should be done with the same intensity and delight that a sensuous person has while enjoying sensual pleasures. If this is too difficult and one is unable to detach the mind from the innumerable objects seen, heard and experienced then Lord Krishna suggests mad bhakto or worship Him in loving devotion. This means to perform actions of propitiation in the mood of bhakti or loving devotion to the Supreme Lord. In the Vedic scriptures it was told: O Narada whatever act of worship is enjoined in the Vedic scriptures regarding Lord Krishna or any of His authorised incarnations and expansions known as avatars should be enthusiastically performed as these very actions initiate the process to a relationship of loving devotion with the Supreme Lord. Worshipping the Supreme Lord Krishna, being devoted to His worship, adoring His Vedically installed deity form every day once, twice, thrice or many times with Tulasi leaves, pushpa or various fragrant flowers, dhupa or incense, dhipa or ghee lamps, mala or flower garlands, beautiful apparel and ornaments, offering bhoga or vegetarian foods of milk products, fruits, grains and vegetables, chanting His names, singing His praises, revealing His glories. Fasting twice monthly on the sacred days of Ekadasi the 11th day before the new moon and full moon and fulfilling the Ekadasi vow of refraining from all beans and grains for this day and if possible keeping awake all night in the ecstasy of communion with Lord Krishna. Celebrating His appearance days with festivals according to one’s means and availability of funds. Acting out His glorious pastimes for others to see. The feeding of guests from the food offered to Lord Krishna which is called mahapradam. The playing of musical instruments in accompaniment to singing His names and dancing in joy before His installed deity form. Then to finalise all offerings and accomplish the completion of all propitiation one should namaskuru or prostrate themselves fully in humble homage with mind, speech and body before the installed deity form of Lord Krishna or any of His authorised incarnations and expansions. The act of namaskuru effectively neutralises any vestiges of egotism which could manifest as pride or pratistha which is subtle desire for recognition from performing such wonderful activities to the Supreme Lord. One should abandon the feeling of pride and renounce the desire of recognition by dedicating all actions and thoughts to the Supreme Lord and surrender them to the spiritual master in disciplic succession to offer to the Supreme Lord. The greatness of namaskuru or prostrating the full body in humble hommage before the Supreme Lord in humble obeisance is explained by Prahlad in theVamana Purana stating: Properly bowing down to Vishnu or Sadashiva who both destroy the ocean of material existence one does not return to samsara the cycle of birth and death. In the Vaisnava Dharma is stated: My devotee even though only speaking the words: I bow down to the Supreme Lord with devotion and faith, attains the supreme destination. When one has achieved the stage of lovingly performing propitiation and worship of Lord Krishna in their life it is very easy to fix their consciousness upon Him. In this way uniting the consciousness with Him in complete communion, depending totally on Him exclusively, renouncing all other efforts and endeavours one shall assuredly attain His eternal association in the eternal spiritual worlds in one’s individual spiritual body without a doubt. I take complete and unconditional shelter of the Supreme Lord Krishna’s devotion with its confidential instruction and the phenomenal potency of the power of bhakti or exclusive loving devotion. 9.34 Manmana bhava, have your mind fixed on Me; [Here Ast. adds the word vasudeva.-Tr] and also be madbhakah, devoted to Me. Madyaji, sacrifice to Me, be engaged in sacrificing to Me. And namaskuru, bow down; only mam, to Me. Yuktva, by concentrating your mind; and mat-parayanah, by accepting Me as the supreme Goal; esyasi eva, you shall surely attain; mam, Me who am God. You shall attain Me evam atmanam, who am thus the Self: I indeed am the Self of all the beings, and am also the supreme Goal. You shall attain Me who am such. In this way, the word atmanam (Self) is to be connected with the preceding word mam (Me). This is the purport. 9.32-34 Man hi etc; upto Matparayanah. Those who are of sinful birth : I.e., the animals, birds, reptiles etc. Women denotes the ignorant. Men of working class denotes those who find pleasure in different vocations, like agriculture etc. 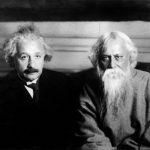 Men of the fourth caste : those who do not have any claim whatsoever for [performing] the Vedic rituals and whose livelihood depend on others. By taking refuge [solely] in Me, even these all attain Me alone. The deeds of the exceedingly compassionate Bhagavat, like the one granting liberation to a chief of the elephants are heard in thousands [in the Puranas]. Certainly it must be so, for those whose behaviour is just the opposite to that of these persons. Some (commentators] declare : The present sentence [of the Lord] intends to glorify the twice-born and members of the ruling class, and it is not uttered with the intention of speaking of the attainment of liberation in the case of the women etc. Indeed these persons [aim to] break into pieces the Graceous-to-all Power of the Bhagavat by foistering upon It, a limited applicability; likwise they do not tolerate the profoundly compassionate nature of the Absolute Lord; they contradict the [Lord’s own] statements ‘To Me none is hateful and none is dear (IX, 30)’, ‘Even a highly evil-doer etc. (IX, 31)’, and other similar statements, very clearly of the same import; with all effort they [strive to] bring in something indicative of duality even in the Absolute-being, Whose non-dual nature has been well established firmly by the diversity of the best reasonings; they are not mindful of other contradictions [that lurk in their theory] with the revealed literature; when simply questioned ‘How is this ?’ and ‘How is that ?’, these persons, having their internal organ totally possessed by the mighty devil of the caste [considerations], concealed within, and having their tongue, face and eyes all twisted by their sense of jealously, hypocrisy and shame-they prattle evil for the entire humanity; and thus they put upon themselves the status of being an object of ridicule. Therefore the above explanation [of ours] does good to all. mat-manāḥ — always thinking of Me; bhava — become; mat — My; bhaktaḥ — devotee; mat — My; yājī — worshiper; mām — unto Me; namas-kuru — offer obeisances; mām — unto Me; eva — completely; eṣyasi — you will come; yuktvā — being absorbed; evam — thus; ātmānam — your soul; mat-parāyaṇaḥ — devoted to Me.